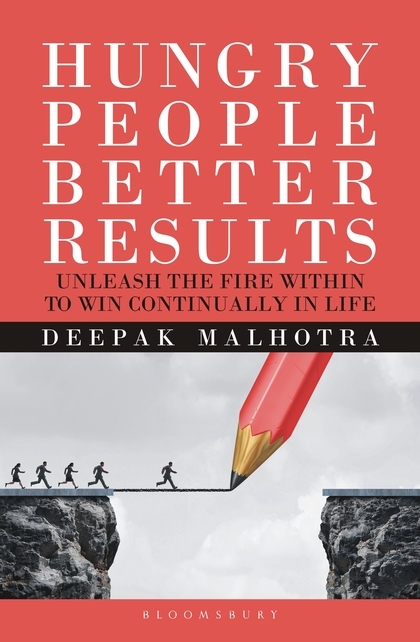 HUNGRY PEOPLE, BETTER RESULTS - Unleash the Fire Within to Win Continually in Life by Deepak Malhotra (2017), Bloomsbury, p 298. Leadership has been a key domain of discussion among academicians and practitioners in last one century starting with a belief on Leaders are born to Leaders can be made. Both the views had their merits and demerits and the literature has proved that one can learn the art of leadership and become successful leader if one is open to learning and has developed a positive attitude towards change. 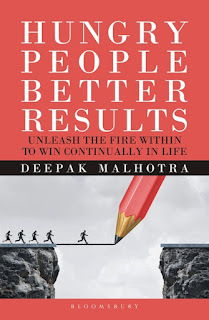 This book by Deepak Malhotra tries to narrate the nuances of practicing leadership through the perspective of selected successful leaders in different areas of their work and profession. Though the individuals who have been selected for their views on leadership and their conception of Hungry People Better Results have proved excellent records yet the criterion of their selection has not been made explicit anywhere in the volume. It seems to be the prerogative and convenience of the author. The efforts made by Deepak to gather together these many leaders is remarkable. Though the book looks like a lengthy volume, once you start reading and flip its pages, you can presumably find it handy, short and simple. At times it gives you a feel that it is an extended version of Oxford book of quotations, but suddenly you find a narrative advice on the ways how one can succeed in life and career. The pathways are illustrative and many a times repetitive. The book has as many as 29 chapters covering achievers and leaders who have strong messages for practice. It includes business luminaries like Kiran Mazumdar Shaw, Harsh Vardhan Goenka, Harsh Neotia, on one side and cricketers like Bishen Singh Bedi and Ravi Shastri on the other. All the leaders and achievers profiled in the book portray strong sense of responsibility. Their vices are convincing, their conception is clear, their advices are authentic and their wisdom is impeccable. Lessons from the corporate boardrooms to the cricket ground, from a successful entrepreneur (PC Mustafa, Preethi Srinivasan, Madan Padaki) to running a big media house (Annurag Batra) and from a cancer fighter (Rahul Yadav) to climbing Mount Everest (Arunima Sinha) are all well recorded and narrated by the author in the book. If I have to summarize and give five common traits that a leader should possess, they could be: High on Integrity, Learning Attitude, Honest Intent, Good Communicator, and High Sense of Humility. The possessions of these characteristics would certainly make one an effective and successful leader. When it comes to theoretical links, one can find these traits well recorded and explained in almost every text on leadership. Hunger for achievement and intrinsic motivation to perform better for the achievement of set goals would surely produce better results. The author has successfully defended the need for Social Media Quotient which is need of the hour but I have my own reservations on its longevity and sustainability, yet it made lot of sense to relate it with IQ and EQ. As one looks at the corporate following the modern ways to respond to their customers and clients through social media platforms and crowd-sourcing many of their new products and services, it seems it is going to have its presence at least for the next few years. And for individual leaders as mentioned earlier, connecting to the audience is important, social media is facilitating it and is able to work as two way communication in multi-channel environment. The writing style of the book is very different as at many places the continuity gets broken and numerous unsolicited suggestions pop up which disturbs the flow of reading and by the time one gets formatted to concentrate on suggestions and preaching, the text of the interview appear. The author has much to say than the people who are interviewed. This could have been avoided to focus on the expert's views on leadership. The overdose of quotations and inconsistent Grey Boxes bites on the seriousness of the text, which could have been minimally incorporated. Many of these quotes are popular and could be seen in almost all related texts. There are typo errors at many places in the book which I think should not find place in a volume of this kind coming from Bloomsbury. At some places the writing sounds pompous which distracts the reader. Otherwise the book is a good account of real world leadership. The doodles given by Adil Malia are excellent pieces of original thinking and provide creative portrayal of organizational and individual reality. Deepak has a lot in store to convey on leadership and motivation, both from theoretical perspective as well as from practice. Though it is his second book (first being – Match the Age to Keep Them Engaged: Decoding the Secrets of Creating a Happy WorkPlace published by Bloombury in 2016), he has shown his capacity to communicate with the reader and to provide examples of leaders of today. He needs to be congratulated for having brought so many leaders from diverse fields in one volume for the cause of finding inner drive to excel in whatever one takes up. The students of management would certainly find it valuable, inspiring and illustrative. Deepak’s presence on social media shall help the readers to connect with the author and converse on the issues narrated in the book.